By comparison to the other three models in our WUXGA Conference Projector Shootout, the Panasonic PT-DZ770UK is a compact little projector that contains a surprising amount of power. While its small case and low audible noise make it seem like a projector for a small classroom, it can crank out over 6500 lumens in its brightest mode, putting it up there with the brightest projectors in the group of four. What's more, the DZ770UK has an exceptionally bright Cinema mode compared to the competition. 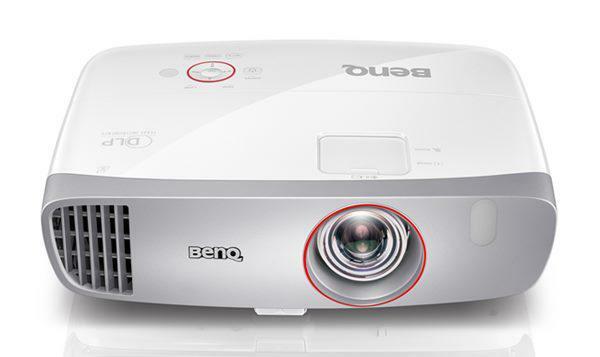 The DZ770UK is a well-rounded, highly capable projector that can do a little bit of everything. It does not stand out above the competition as uniquely the best in many common evaluation parameters -- it is not the highest in contrast or the brightest or the least expensive or the easiest to maintain. But it functions well as an all-purpose projector, making it a viable option for a variety of conference room and small auditorium uses. And its bright Cinema mode and very quiet fan are two areas in which it does excel; with its small footprint and quiet operation, you might even forget it's there. Image quality. Taken as a whole, the DZ770UK's image is bright and balanced. The best image mode by far is Cinema, which is the brightest video-optimized mode of the four projectors in the test group. Cinema mode has excellent color saturation and image balance. The DZ770UK does not have frame interpolation, but its video performance is smooth and relatively artifact-free. The projector is not overly prone to DLP rainbow artifacts, and we saw fewer rainbows on the DZ770UK than competing models. On the other hand, Dynamic mode, with its high light output but relatively weak color saturation, shows quite a bit of digital noise when video content is displayed. Photographs can appear out of balance due to too-bright highlights. As a result, we'd recommend using Cinema mode unless you really need the extra brightness. High light output. The DZ770's Dynamic mode measures 6531 lumens, which is among the highest light outputs recorded. However, the white-screen brightness of a DLP projector is only really valid for black and white subject matter due to the way DLP projectors create color. When displaying content with a heavy color component, the DZ770's Dynamic mode only looks about half as bright as it does when displaying a text document. More importantly, though, Cinema mode measured a whopping 3643 lumens, making it the brightest projector in the shootout in its video-optimized mode, with excellent color saturation. Cinema mode has none of the image balance problems seen in Dynamic mode, and color looks almost as bright as white. If you need a bright color-optimized picture on the screen for photography or graphics, this is one of the DZ770UK's special strengths. Quiet operation. The DZ770UK is the quietest of the four projectors in the shootout, and also produces the least amount of excess heat. It uses relatively low-wattage (300W) lamps and an internal liquid cooling system to regulate its temperature. The result is a quieter projector that can be placed in smaller rooms without overwhelming the audience with noise or heat. Contrast filter. Contrast is most important when the lights are dimmed, but these projectors are not always used in that kind of environment. That's why the DZ770UK includes a contrast enhancement filter. In the menu, turning it on results in a notable increase in contrast as the filter slides into place. The projector loses about 25% of its light output when the filter is deployed, but in a darkened room the DZ770UK has lumens to spare. The end result is a simple, easy-to-use option that makes the projector more flexible and enhances image quality when required. Easy to use menus. The DZ770UK's menu systems are large, clearly labeled, and easy to use. The menus are blue, and the active item is highlighted in yellow, making it impossible to mistake what you're working on. What's more, the remote has a "display" button that will temporarily hide the menu for you if you need to see the image behind it without losing your place. The menus combined with the intuitive, responsive remote control make the DZ770UK easy to use. Light output. Out of a rated 7,000 lumens, the DZ770UK will produce 6531 lumens in its brightest mode, called Dynamic. Dynamic mode has a strong green bias, and it shows a lot of noise during video playback, but it is ideal for data display when color is not the most important factor. As mentioned above, color content appears significantly less bright than white subject matter, leading to an image that appears out of balance whenever content with a heavy color component is shown. The DZ770UK has several other image modes that offer better color saturation and contrast in return for less light output. These are: Graphic (4918 lumens), Standard (4900), Cinema (3643), Natural (3414), Rec709 (3385), and DICOM SIM (3414). The most interesting of these to us is Cinema mode, which pumps out 3643 lumens maximum with excellent color saturation. This is over half of the Dynamic light output, which is an unusually high amount of light for a video-optimized mode. Keep in mind that this does not include the action of the contrast filter, which will further drop light output. The DZ770UK can be run in single-lamp mode to cut output in half, or switched into Eco mode to reduce output by 25%, or both of these. You can run the projector in two-lamp Eco mode, or one-lamp full power, or one-lamp Eco. Contrast.The DZ770UK's dynamic range is solid, but black level is relatively weak. The contrast filter helps to better define shadow detail and deepen blacks, but compared to some of the other projectors in the Shootout it doesn't have the same punch. Contrast is perfectly adequate to display data and graphics, while photographs look more or less how they should. In a room with any significant amount of ambient light, the DZ770UK is a very capable performer, since black level is not a concern when ambient light is present. However, in a dark room and especially when watching video, the DZ770UK lacks pop when compared to its competitors in a side-by-side test. Calibrating Cinema mode is easier. Green was slightly too prevalent, especially in the high end, so we reduced it by 20-30 points for a more balanced image. Keep in mind that the two adjustment scales are different; by default, all High adjustments are peaked at 255. The best mode for color is Rec709, which measures roughly 6500K across the grayscale without any adjustment and has an accurate color gamut. However, contrast is weaker than in Cinema mode and color is less saturated, making Cinema our preferred mode for film and video. Rec709 is a strong choice for photography, though. Sharpness and clarity. As a single-chip projector, the DZ770UK has no problems with panel alignment, and pixel structure is crisp and clean throughout the image. The lens does not introduce any problems with edge-to-edge sharpness, resulting in a picture that is sharp and focused from corner to corner. Fine detail and small text are displayed in crisp, clear, pixel-perfect precision. Video detail is distinct, with the caveat that Dynamic mode's heavy digital noise will make the picture appear softer than it actually is. Jack of all trades. The end of that phrase is "master of none," and that applies here. The DZ770UK is a good all-around projector, capable of displaying video, data, photographs and graphics cleanly and clearly. Contrast is not as strong as some of its competitors, but overall it does a solid job. However, for any one type of content, there is usually a competing projector that does it better. If you are looking for a projector for a multimedia room where a wide variety of content is expected to be displayed, the DZ770UK is a strong option because of its flexibility. On the other hand, if your intended use involves primarily the display of just video, or just data, or just graphics, there are competing units that can be optimized to produce better results for that particular task. Contrast. As stated earlier, black level on the DZ770UK is lackluster. Content that pops on other machines can look dull and washed-out on the DZ770UK in comparison. That does not harm performance in ambient light where the bright Cinema mode does exceptionally well since contrast takes a back seat to light output in that situation. But in dark rooms the DZ770UK falls short of its rivals. Ease of Maintenance. The DZ770UK does a number of things right when it comes to maintenance--the projector's screws are captive so you can't drop them, and the filter cover is tethered as well. However, the lamp cover contains cooling fans, and the cover itself is not tethered, meaning it's possible to drop an expensive projector part that is necessary for proper functioning. The Panasonic DZ770UK is a powerful WUXGA projector that has a little bit of everything. Its real strength is in its Cinema mode, which offers the killer combination of high light output, strong color saturation, and good default color accuracy. The projector's small size, low audible noise, and low heat exhaust make it usable in smaller rooms where some of its competitors would overwhelm the space, but the projector has the lumen power to be used in a much larger room without issue. The DZ770UK does not uniquely surpass the competition in most common evaluation criteria, but it is a solid performer across the board with no serious weak points. When a projector is needed to display all types of content, from film to PowerPoint to graphics to spreadsheets to photography, the DZ770UK is highly capable and easy to use. Hi. we have 6 numbers of these projectors in our company.. these are nice shooters.. no doubt about it.. but there is no corner correction .. there is no factory reset option. why panasonic has done it this way.. ?? anybody can tell me?